Emmett, Ray, age 75 of Goodlettsville, Sunday, June 2, 2013. Visitation, 2-8 pm Wednesday At Cole and Garrett Funeral Home, Goodlettsville. Funeral service will be 1 pm Thursday at St. Joseph of Arimathea Episcopal Church, 103 Country Club Dr., Hendersonville, TN 37075. Interment, Forest Lawn. COLE & GARRETT FUNERAL HOME, Goodlettsville, 615-859-5231. Ray will be forever in our hearts, his smile will be with us forever as well. He was a Special Person and we loved all the times spent with him. He will be missed always. R.I.P Ray You’ll forever be in our hearts. To Renee and the family our Thoughts love and prayers is with each of you and we deeply share in your loss. God be with you all. And Ray we love you. As usual my reply vanished. I knew Ray from Flint at Contos nightclub too. I used to go to their afternoon rehearsals, RAY EMMETT AND THE SUPERIORS. I also booked them at my theatre in Saginaw for a stage show called a HOOTENANNY. I moved to California and lost track of them. Ray had emailed WTAC thanking them for helping his career. And I got his email off his email to them. He was sure surprised to hear from me. 50 years or more later. Ray was two years older then me. I asked where his band ended up? He said HAWK died. I didn’t write down his first name nor did I keep his emails to me. Hawk had recorded, I NEED YOUR LOVIN’ EVERYDAY. Ray was surprised I remembered it. I mailed him my last copy of my book with a chapter on Saginaw mentioning he had played there. I hope he got to read it. I sent him a Christmas card and it came back deceased. Shock hit me hard. I thought it was only a year ago we had talked. Three years ago! As we age time flies. Ray was two months older than me. If anyone has a photo of them at Contos, please send me a copy. I would appreciate it very much. It had been over 50 years since I knew them but I still miss them and him today. I guess a visit passed me by. Happy Father’s Day, Dad. I’m going to miss you so much. Nashville will never be the same. Rest in Peace Ray..you will be missed.. I knew Ray probably since the first day he came to Nashville. I did not work with him much, but when he was around we had wonderful times and conversations. excet one. That was when he told me about finding Faron, a very sad story. May God Bless the entier family in their loss. Ray was a longtime friend going back to the days when he first came to town (1968)to record for Pete Drake’s “STOP RECORDS” label. My singing group – The Four Guys – provided vocal backup on what I think was Ray’s first record. During the recording session, we began joking, laughing and basically “horsing around.” That light-hearted, good natured approach to the music business continued through more than four decades. I will miss him and his bright smile. You will be missed by many. Love you guy! My heart is heavy with sorrow for the loss you are enduring. I will always remember Ray as a kind man with an amazing smile, wonderful laugh and words of wisdom. My prayers are with all of you. I am so sorry to hear of the death of Ray. He and I were long time friends. I met Ray back in the sixties when he came to Atlanta to work. We work many road gig together. Being he and I both played bass and did vocals we never worked in the same road band. I haven’t seen him in many years but stayed in touch through face book and e-mails. I wish I could be there to go that last mile with him but it is not possible. My thoughts and prayers will be with you. See you on the other side my brother. Hey Renee, so sorry to about the passing of Ray. I first met Ray back in 81. I was just 17. I was playing drums with Justin Tubb and Ray did a lot of dates with us. I thought a lot of Ray. Sorta of a father figure to me I will miss him dearly. My thoughts and prayers are with you and your family at this time. So sorry to hear of your loved one’s passing. I regret not getting to know him all the 25 years I lived in Nashville. From what I’ve read, he must have been a fine musician. I’m sure he will be greatly missed by you and so many in Nashville. To Renee and other family members and friends. I have had the pleasure of knowing Ray for many years. He and I both shared, at different times, Front Man and Bass Player with the late and great Faron Young. I hadn’t seen him in a couple years, to which I regret. He was well loved and respected in the CLASSIC COUNTRY FAMILY. PAM AND I will miss him and hope he’s in a better place. Our hearts truly go out to his family. He was a great man, a great dad, a great grandfather to my kids, a great friend. He missed his mom, my grandma, the most, I am comforted they are now together again. The world has lost a wonderful man and I have lost of friend of 40 years. My thoughts and prayers are with his family at this time. May the lord bring you peace during the time ahead. 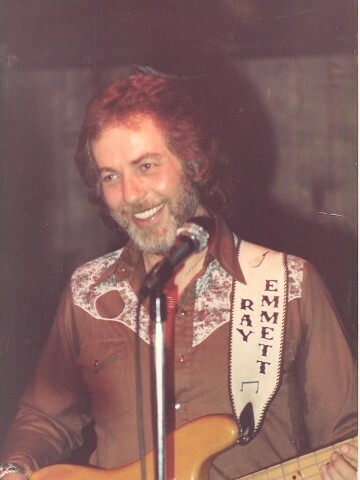 Ray has been a close friend to my husband Chuck and I since is days in Flint where is performed with Ray Emmett And The Superiors. Our families did many things together and he stayed in our home for a period of time. I was fortunate enough to visit him last Spring with my son Matthew who lives in Nashville. He called recently to see how I was doing in rehab of my fall but I could answer as I am on a vent, so he lift a message. My son called for me the last few days and found out he had passed. I am truly devastated. My prayers go out to all his family. I love you and will miss you. You’ve been more like a father to me in my younger years than a grandfather. I’ve always looked up to you and always will. You are the greatest man I have had the honor and privilege to know. I love you Quacker!!! i worked with ray at montgomery wards in flint back in early 60s in the auto department. also wentto indy 500 with hin. nice guy. I posted and it got lost. It is at the top of the page.